As a new patient to the Retina Macula Institute, Dr. Ron Gallemore and his team of professionals would like to welcome you to our Retina Family. Your first appointment at the Retina Macula Institute will involve a comprehensive evaluation of the back of your eyes, “The Retina”. 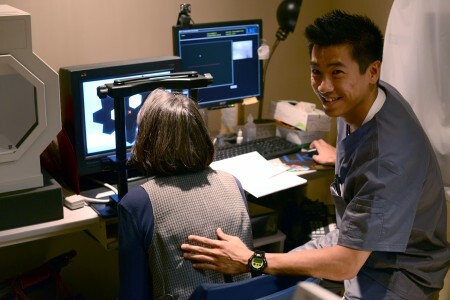 First, we will take a detailed history, followed by preliminary testing, conducted by our staff, and an examination of the vitreous and the retina by Dr. Ron Gallemore. Your eyes will be dilated, during which special drops are used to enlarge your pupils. The pupils are the black openings at the center of your eyes. 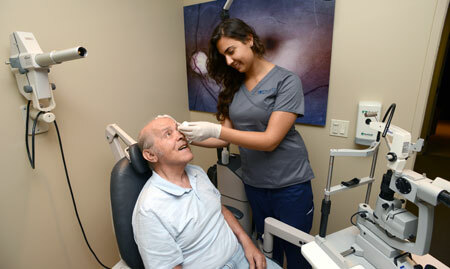 Dilating allow Dr. Gallemore to better view the inside of the eye, particularly your vitreous and retina. Please be aware that your vision will be blurry for a brief period following dilation. Please set aside an hour or more for your initial consult. If additional tests are required, your visit may go beyond the hour. Please remember to bring a driver with you since dilation may interfere with your ability to focus while driving. Any previous eye medical records will be helpful. If you are a diabetic, please remember to bring snacks with you. New patients are expected to bring insurance cards, a driver’s license or any other form of ID. Please also bring a list of current medications, including any eye drops or vitamins. When you sign in, you will be given a packet to fill out regarding your past and present medical history. This is to ensure the best possible care from the staff. Please complete these items to the best of your ability. If you are visually impaired and unable to complete the form, please do not hesitate to ask one of our staff members for assistance. A consult report will be generated at the end of your initial visit. Therefore, it is important to provide our staff with the name of your primary care physician and most importantly the name of the doctor who referred you to Dr. Gallemore for a comprehensive retinal evaluation. We encourage you to bring a book or magazine to help minimize anxiety during the wait.